Either way, we have found that having an Art Gallery dedicated solely to the children's art work helps them to feel proud of their work and also makes a fun focal point for a family room or play room. I created this Art Gallery over three years ago but took it down a few months ago while we were rearranging spaces in our home. We turned the living room into a play room and this past weekend I hung the Art Gallery back up. Use frames you already have (great use for those that the glass has broken in) or hit up a thrift store for basic frames. Ideally you will be able to get several shapes and sizes to make an interesting wall (and to house different sizes and types of art). The best frames to use have a flat front though. I got some with textured designs or tilted wood and those have had to be fixed occasionally whereas the others stayed put. I don't have photos of these steps as I did it before I was blogging but I can explain the process to you. Before painting, flip the frames over to see if they have a sawtooth hook for hanging on the wall. If not, use the sawtooth hooks in a picture hanging kit and add them at this step. I find placing the frame on a towel protects it from breaking while you hammer it in. Then, lay them all out on garbage bags in a ventilated area (open garage, basement, driveway if it's not too cold) and then do a few coats of paint on them over the course of the day. The clothespins are the trickiest so be sure to use gloves and turn them all around to get those nooks and crannies. Once they're completely dry, you can attach the clothespins to the front of the frames by putting a generous glob of glue on the top middle part of the frame with your glue gun. Carefully press the clothespin onto the glue and hold for thirty seconds or so. Be sure it's got the clamp part pointing down! Let it set for an hour or so to be completely dry and then get to laying out the gallery design! If you have any other artwork (like our CREATE splatter paint canvas or our Picasso quote) that you wish to include, now's the time. I do this step on the floor first to see how the pieces will look together (and snap a pic so I don't forget what order they go in) and measure the space to make sure the design fits. You can hang the frames up at this point! I hear they have handy picture hanging tools to do this besides the trial and error method I use, but go with whatever you've got until they're even-ish and you're happy with the result. The last step is to add the artwork you want to display! Usually the kids swap this out whenever they make or bring home a new piece of art so it's a great living wall of art - and a great conversation starter whenever someone comes to visit. The children love showing them their latest masterpiece displayed on the wall. 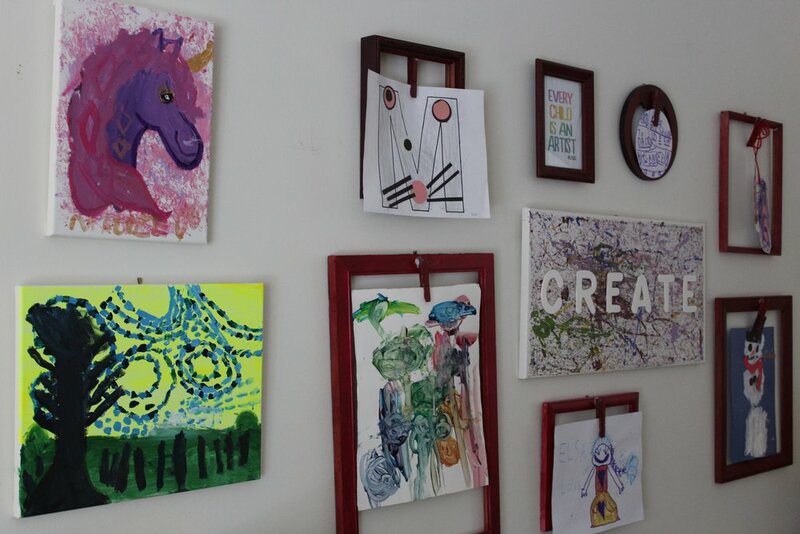 How do you like to display your children's art work?